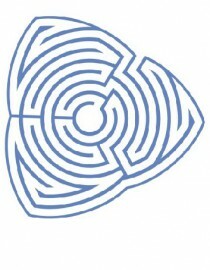 In the first part of Man, The Animal Without Essence I focused on the myth of Prometheus and Epimetheus, in the second part I looked at Plato’s cave allegory in relation to prehistoric art and Werner Herzog’s Cave of Forgetting Dreams, and in the third part I analysed Andrei Leroi-Gourhan’s theory of technical evolution. In this final part I will present Leroi-Gourhan’s analysis of our history of tool making and how this has affected the way we understand time. What does progress amount to when it comes to creation of tools for cutting? It amounts to the ability to make progressively longer edges, and sharper edges, from the same sized rock. The longer the edge [spatially], the longer the tool [temporally] will function as a tool before becoming worn out. Previously I mentioned the importance of the evolution of the upright stance increasing the mobility of various parts of the human being, from the hand to the face; well, the use of tools that follows from this freeing up itself increases the organism’s mobility, but in a more general sense it widens the domain over which the whole animal can range. It can travel greater distances because of its improved techniques for fashioning cutting edges. Why is this? 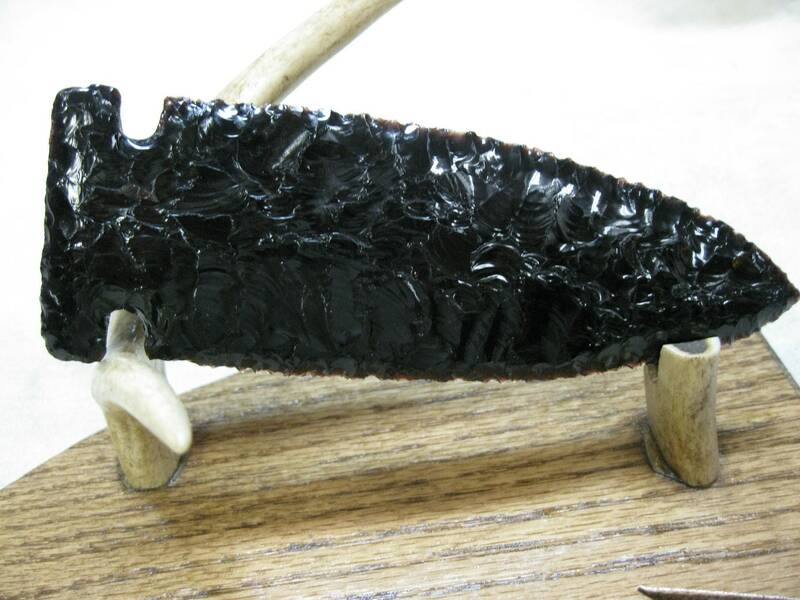 Because the cutting tools were used for killing and skinning animals for food, however, the rocks used to make these tools were not abundant everywhere, only in select geographical locations, used as quarries. And the primitive human beings could not stray far from these quarries, otherwise, when their tools had worn down, they would be left without a way to kill their prey, which would eventually lead to death. 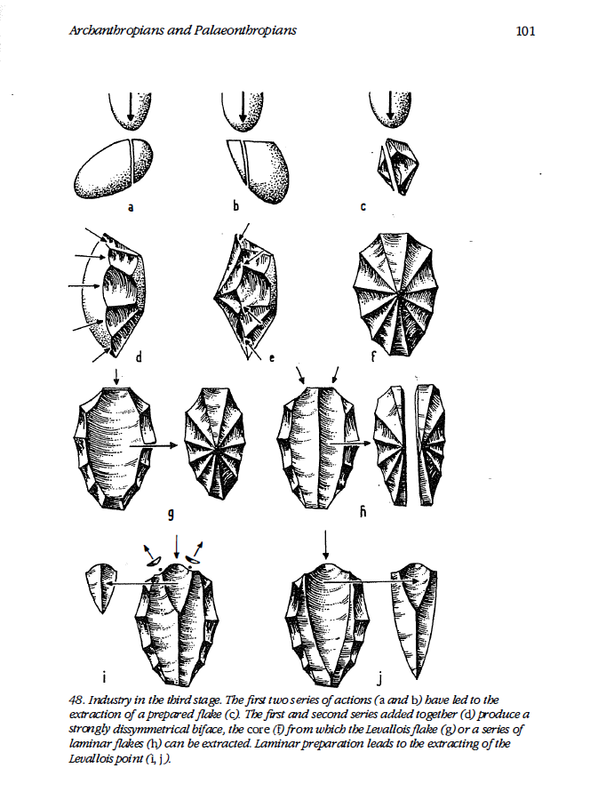 The idea is therefore that longer the cutting edge of their flint, the longer the tool would last, and hence the further they could stray from their quarry. But this increased mobility was accompanied by yet another crucial development: the longer the journey, the greater the ability to plan ahead and to anticipate i.e. to think, and more specifically, to ‘think ahead’. So the increase in sophistication in the history of the tool (or technics) runs parallel with an increase in the amount of space and time that man is capable of mastering, both in his mobility and in his thought. But let us say some more about this idea of anticipation and thinking: it is not just something that is done once the tool has been made and the hunters are preparing for a journey; first of all this anticipation is a part of the very manufacture of the tools. 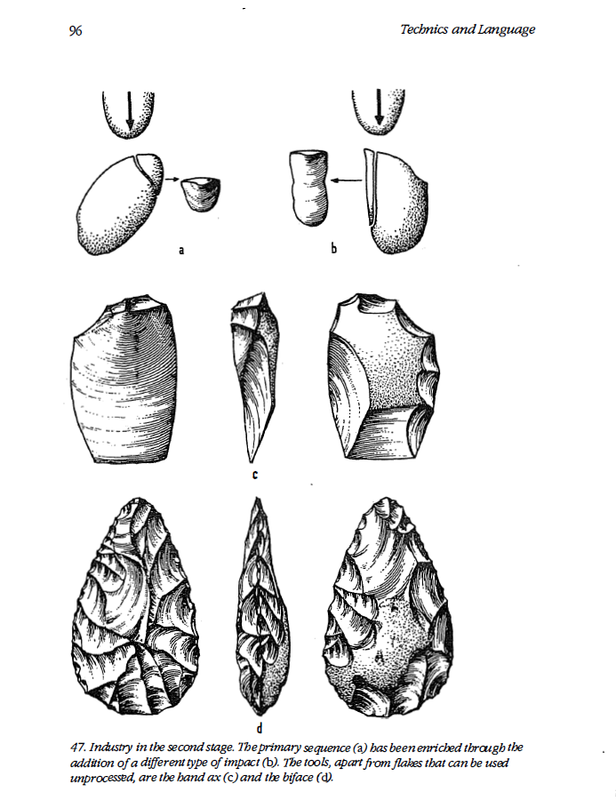 As we can see from the diagrams below, with the earliest tools, one simple technique was needed to produce a sharp edge. But to produce longer edges, more and variegated techniques were required. When there is more than just one simple procedure for making a sharp edge on a formerly smooth stone, the maker of the tool must be capable of looking ahead, of anticipating, of planning to make a tool. And the more sophisticated the tool, the more procedures that are necessary to make it. Thus, its creator requires more foresight, more anticipation: a greater understanding of time, or rather a greater ability to relate to the future, to plan and to anticipate. In other words, the human being’s relation to time is intimately bound up with the history of the technics: of technical objects and the techniques for making them and using them. Bernard Stiegler, whose most famous book series is entitled precisely ‘Technics and Time’ is interested in these tools also from a slightly different angle: from the point of view of the present. In other words, he is interested in these tools from an archaeological standpoint. If we think of these tools from our perspective, and no longer from the perspective of the prehistoric man who used them, we can see them in another aspect. These tools act as records of an earlier state of man, and an earlier state of the human brain: it thus becomes possible to treat archaeological artefacts as memories of the past, and memories of a past of which we retain no other records – prehistory rather than history. The bones and stones uncovered by palaeontologists act as ‘tertiary’ memories of a time which we never lived through, and which was never recorded in any book of history. Since man comes into existence as soon as he assumes an upright stance, this means that he comes into existence as soon as he begins to use his hands to make tools, and to hold them. This means that man and technics come to be at the same moment, but since these tools are a kind of memory, a record of the human being’s development, we can say that there is no man without this (tertiary or epiphylogenetic) artefactual memory. 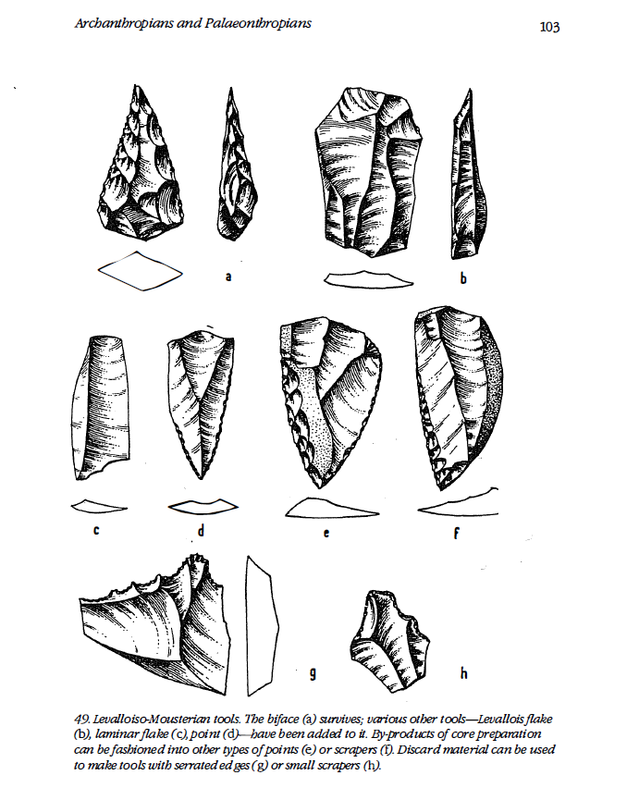 ‘The emergence of tools as a species[-]characteristic marks the frontier between animal and human’ (GS 90).